Remember those Electric Football games? You know, the ones where you had the little plastic football guys mounted on tiny platforms and you set them up on a little metal football field and then plugged it in and the metal field started to vibrate thus causing the guys to move, jittery and jumping, bumping up and down the field. Well, I was thinking. What if instead of football guys you had a bunch of zombies and a few survivors, and instead of a field you had like a little town or whatever. You place your survivor guy and then turn on the game and the last one to be touched/eaten by zombies wins. 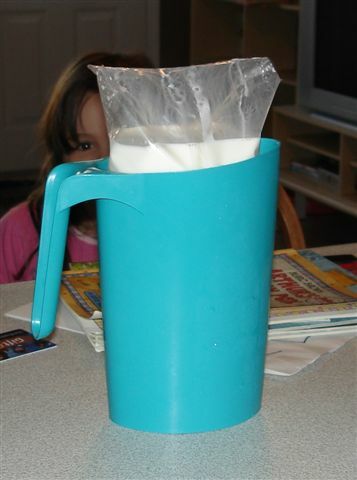 Does anyone else remember Milk in a bag? I do. We got milk in a bag when I was kid. We even had that exact same pitcher to put it in, except ours was a kind of orange-red color, almost like ketchup. We were talking about this at work today. It was the woman from Canada who brought it up. Everyone else, except for me and one other Canadian, was oblivious to milk in a bag. Is this a Canadian thing? And if so, why do I remember it form my childhood? It does seem a bit odd, I suppose. I do remember it spilled easily, but then I spilled everything when I was a kid so…. Take me out to dinner and it was pretty much a guarantee that before the end of the night I’d spill my glass of water/pop/whatever, or someone elses. I’d honestly thought they’d stopped producing milk in a bag, but apparently not.